Hunter Allen and Andy Coggan have updated their bestselling book, Training and Racing with a Power Meter. Allen and Coggan have completely revised the book that made power meters understandable for amateur and professional cyclists and triathletes. Training and Racing with a Power Meter, 2nd Ed. is now available in bookstores, bike and tri shops, and online. Power meters have become essential tools for competitive cyclists and triathletes. No training tool can unlock as much speed and endurance as a power meter-for those who understand how to interpret their data. A power meter displays and records exactly how much energy a cyclist expends, which lends unprecedented insight into that rider's abilities and fitness. With the proper baseline data, a cyclist can use a power meter to determine race strategy, pacing, and tactics. Training and Racing with a Power Meter, 2nd Ed., will continue to be the definitive guide to the most important training tool ever developed for endurance sports. To review the table of contents and a sample, please visit velopress.com. For online widgets and information on using Training and Racing with a Power Meter with TrainingPeaks(tm) software, please visit peakscoachinggroup.com. 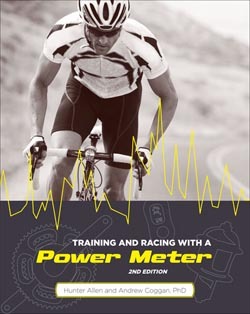 Hunter Allen is considered one of the world's top experts in training with power meters. He is the co-developer of TrainingPeaks WKO+, software which he has used to analyze over 3,000 power meter files. Allen is a USA Cycling elite-certified coach. He raced professionally for over 17 years. Andrew Coggan, PhD, is an internationally recognized exercise physiologist. His research provided the foundation for the TrainingPeaks WKO+ software, which he co-developed with Allen. Coggan is a research associate at Washington University School of Medicine. He holds a PhD in Exercise Physiology from the University of Texas and an MS in Human Bioenergetics form Ball State University.